Note: if you are looking for the Hero Arts My Monthly Hero post, it is here. Since then, I've learned that Cinco de Mayo celebrates one military victory by Mexico over the French. Apparently, Mexico had defaulted on some debts, and Europe invaded in order to collect its debts. Good grief. The other countries involved negotiated terms of repayment, but France continued its invasion. It took six more years of war for Mexico, with the aid of the US, to win the war. This holiday is a minor one in Mexico, but in the US it is an opportunity to celebrate the Mexican culture and its contribution to the culture in the US. Of course, we've turned it into one big margarita love fest, but I guess any excuse to party is a good thing. I live in Northern Virginia and our area benefits from the diverse cultures that live here. In fact, my neighborhood is called the Mosaic District to reflect all the different cultures that live and work in Northern Virginia. 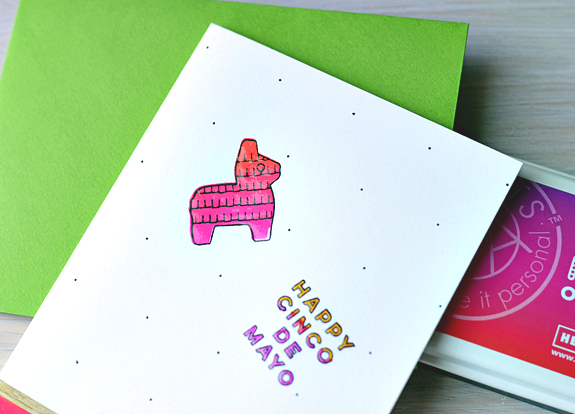 I used this Hero Arts Neon Red to Purple Ombre ink pad to ink up the pinata and the bottom edge of the card. I love this ink! It plays off black beautifully. It was an impulse buy at my LSS, and I'm glad I got it. That little strip of wood paper towards the bottom of the card was an impulse buy at Target from its Handmade Modern line of craft supplies. It's called "12 x 12 Wood Veneer Sheets," and the name is a bit of a consumer fraud. Only one of the sheets is 12 x12. I wonder if I could sue and make a zillion dollars? Go out and buy some and we'll do a class action!! Actually, the dimension of each sheet are listed on the package in small print. I bought this stuff in a store and could have read the back, but anyone buying online would be ripped off. That said, I got it on sale and like it. It is self adhesive and a little goes a long way (you can die cut it also). I covered the pinata and the words with Pico Clear Embellisher. Love this stuff because it comes in a container with a thin needle and is available in a ton of colors. After the words dried, I used a few Copics to color over them. This was the perfect way to use the Copics and not worry about bleed through. I'm trying to show the shine in this picture. As I write this, I'm in Chicago accompanying the husband on a work trip. It is cold and windy and gray, but our hotel has a beautiful view of the river. Unfortunately, I had to make an emergency trip to a doctor to deal with a very painful shoulder/arm tendon issue. Let's hope the steroid shot kicks in soon as it is a bear having the use of only one arm. Luckily, I'm able to type and am so grateful I was able to see a specialist on a moment's notice. Shocker! Can you tell by this rambling post that I've been stock in a hotel room for two days watching politics? HA! MOOD WHEN DONE = Happy, and apparently, implusive! Happy Cinco de Mayo to you and I hope your arm is feeling better soon. This is a lovely, cheerful card and I was amazed that you colored over the Pico thingie with Copics. I have to try that! Happy Cinco de Mayo, Joan! And welcome to Chicago! The weather is suppose to get better today - though it always differs a bit, especially temperature-wise, down by the lake. If you are still in town tomorrow, it is suppose to be sunny and in the 70's. Perfect! If you've never done one, an architecture tour by boat is a fantastic way to see the city. And don't forget "The Bean" and the Art Institute. 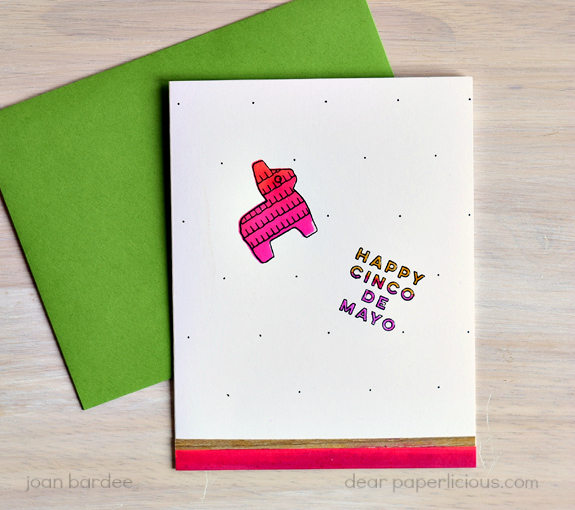 Oh, and love the bright card for Cinco de Mayo. Thanks Laurie! The sun is now shining so that is fantastic. We leave tomorrow so we will miss the best of the weather, but that's ok. With my shoulder issue it is hard to get dressed, etc. but I hope to make it outside this afternoon. we are right by the river but did the architecture river tour and the art institute a few years ago. we may just take a nice stroll along the river this afternoon. Not sure! Thanks for the note. Oh, those impulse buys! My stamp room is full of them. Too full. Some are great, some not so great. I really like the Ombre ink in its nice, bright colors. Sorry about your shoulder. Here's to hoping that your shoulder feels better soon!!! Great card, and thanks for the "heads up" on that veneer (I would be upset)!